Gordon's Dry Gin serving tray measuring 10 1/4" diameter. 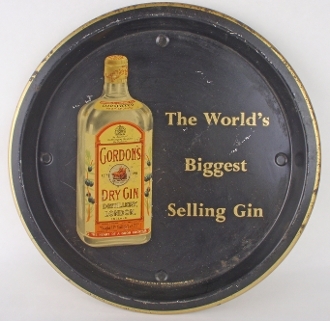 "The World's Biggest Selling Gin" tray printed in Great Britain by Reginald Corfield Ltd 0129. Printed on the label of the gin bottle pictured is the saying "The Heart of a Good Cocktail". Nice tray with some scratches, dents & rust. This is thought to be a 1960's or 1970's vintage tray. Hard to find serving tray.